'Intentional' Car Explosion Leaves 3 Dead in Pa. The vehicle exploded on the 700 block of West Turner Street near North Hall Street around 9:30 p.m. 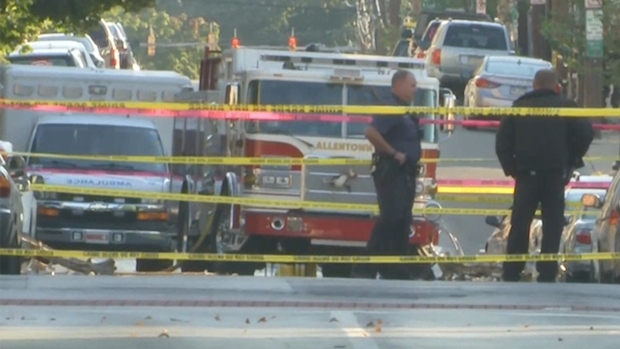 The investigation continues after a car explosion killed three men in Allentown, Pennsylvania. Witnesses are speaking out. UPDATE: Officials have identified the three people killed in the blast, including a father and his 2-year-old son. New details HERE. 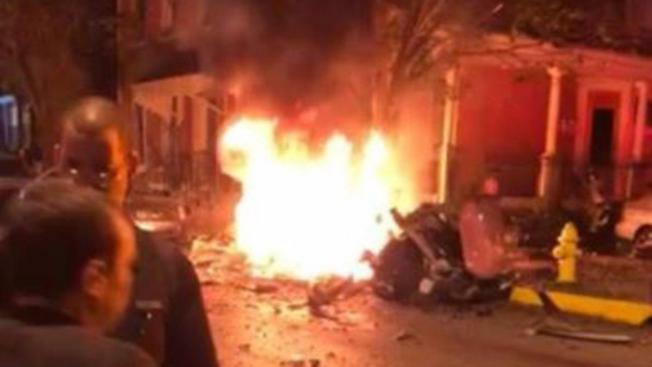 Three people were killed in an "intentional" car explosion in Allentown, Pennsylvania, Saturday night, officials confirmed. Autopsies are set for Monday. The vehicle exploded on the 700 block of West Turner Street near North Hall Street around 9:30 p.m. Three males died in the blast. Officials have not yet revealed their identities, though they also said there is a "high degree of confidence" that the perpetrator was killed in the blast. One neighbor told NBC10 that his entire apartment building shook after the explosion. Another said it sounded like fireworks going off in the street. "We heard a big blast and we ran out to our balcony to see if we could see anything," neighbor Jonathan Pack said. "My gut reaction was bomb." Mike Hunter, another witness, was about a block away from the blast when he heard the explosion. "People were yelling. People were running," Hunter said. "People were scared." Hunter grabbed his cellphone and recorded the aftermath. The video showed a car engulfed in flames, as well as what appears to be body parts on the ground. "I've never seen anything like that before," Hunter said. "I've only seen things like that on TV." Police initially reported at least two people were injured. Shortly after midnight, ATF officials confirmed that one person had died. During a Sunday news conference, officials said an additional two men were killed but added that the incident was isolated and there was no threat to the public. Dozens of ATF agents responded to the scene Saturday night, which they said appeared to be a "criminal matter." County, state and federal officials were also involved in the ongoing investigation. Local residents were advised to avoid the area and find alternate routes around the crime scene. A shelter was set up for residents who were kept out of their homes due to the investigation, which officials said could last for several days. On Facebook, Allentown Councilman Courtney A. Robinson expressed sympathy for the victims and the community at large, and warned that "this will be a complicated investigation and it will take time until we know what happened." Neighbors, meanwhile, described a confusing and terrifying scene moments after the blast tore through the area. "As soon as I turned around I heard a big boom," Desiree Guth, a witness, said. "I saw the car on fire. I saw a leg by the car and I ran away." The FBI, ATF and Allentown police continue to investigate. If you have any information on the incident, please call 1-888-ATF-BOMB. Officials said an 'intentional' car explosion left at least three people dead in Allentown, Pa., Saturday night.